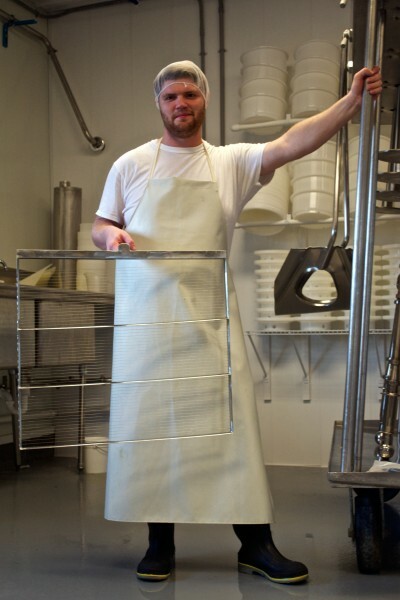 This blog series is written by Lively Run Dairy’s head cheese maker Pete Messmer. 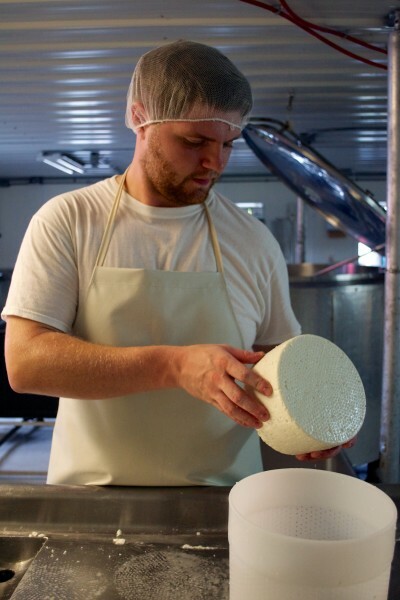 Pete loves talking cheese and sharing his abundance of knowledge about cheese and the cheese making process. As a cheese maker who likes to stay somewhat informed on the state of the artisan cheese community in the United States, I’ve been hearing a lot of ramblings, both good and bad, about the term “affinage”. Articles, like this one titled “Cheese: A Coming of Age Story,” by the New York Times, show that people are increasingly interested in affinage, although there is a great deal of confusion about what exactly affinage is. In this two-part blog, I’m going to discuss some of the history of affinage, what some of the current trends are, and what I think of them, as well as my own approach to cheese aging. 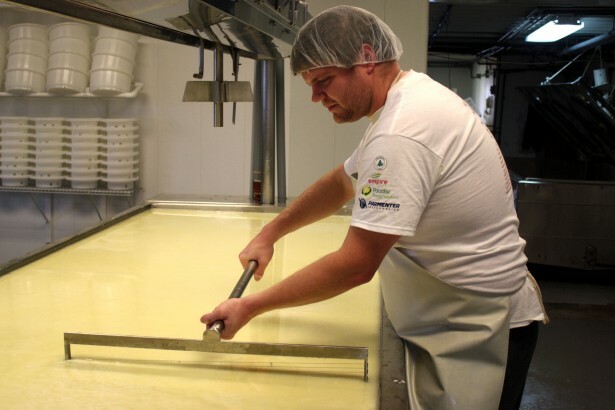 In this first post I’m going to talk a bit about the current trends of affinage and then give some of the background on the history of affinage in traditional European cheese making. Affinage literally means “refinement” or “finishing” in French. In the context of cheese making, affinage is the process of taking young, “un-aged” cheese (often called “green cheese” in the artisan cheese industry), and aging it to its optimum age. The person who does this is called an Affineur. Many times, especially with smaller cheesemakers, the Affineur is the same person who makes the cheese, while sometimes the affinage is handled by a completely different company altogether. Of course, there are so many different variations and mixtures of the two that it can be hard to keep track of all of the different permutations.To simplify this blog, I will refer to affinage as aging. Since we don’t really have a good version of the word affineur in English I will continue to use that term. Increasingly in the US there is a movement for the higher end cheese shops and cheese mongers to do some or all of their own aging. Many, like Murray’s Cheese Shop in New York, have built their own aging caves. This can be both a good and a bad thing. I’ve often heard criticism that cheese shops doing their own aging can lead to inflated prices and an increase in the already dense fog of pretension that fills them. On the other hand, proponents say that on-site aging can help customers to get cheese that is at its peak flavor-wise. I think that it’s important to remember where the tradition of off-site cheese aging (meaning aging cheese in a different location from where it’s originally made) comes from. In the European countries like France, Switzerland, Spain, Italy and Austria where mountain cheeses are made, off-site aging is common and very traditional. Gruyere, for instance, is usually made high in the mountains in a tiny chalet by the same farmer who milks the cows. Typically made in the Summer, the farmer and a helper (usually a family member) will milk the cows early in the morning, bring the milk back to the chalet and make it into cheese, then go back out in the evening to milk the cows again. The evening milk is added to the next morning’s milk. The farmer will stay in the mountains milking cows and making cheese all year, sending his green cheese down into the valley below for aging. The aging facilities in the valley will receive green cheese from farms throughout the mountains and age it all in the same system. Check this website out for some great pictures of the process of making Guyere. This system evolved for a reason: the farmers/cheese makers had to remain in the mountains with their herds for the summer but they needed a place to age their cheese, so they formed a cooperative and built a communal aging space where all of their cheeses could be aged by dedicated affineurs. This system is very efficient and obviously resulted in some serious advantages over independent individual aging such as decreased costs and a more consistent final product. In fact, this system is so successful that it is used all over Europe for many different traditional mountain cheeses like Beaufort, Emmentaller, Comte, Manchago and many others. 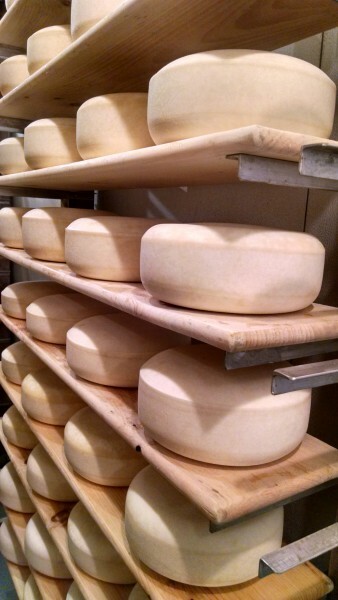 Specialized off-site aging is especially important to the Swiss-style cheeses that use proprionic bacteria. Proprionic bacteria are the micro-organisms that eat lactose and produce CO2, creating those nice round holes in Swiss cheeses like Emmentaller and the traditional sharpness that is particular to Swiss-style mountain cheeses. The catch with proprianic bacteria is that it develops best at about 70 degrees fahrenheit while most cheeses age best at around 55 degrees. The solution that the makes of Gruyere and Emmentaller have come up with is to age the cheese in a warm room for a few weeks in order to develop the eyes, and then move the cheese to a 55 degree aging room for the rest of its aging. This of course means that they need at least two different rooms in order to properly age their cheese. All of that would be very difficult for the small farmer/cheese maker to handle financially and infrastructure-wise, so the cooperative aging system became a very successful model for these farmers. So that is some of the history of affinage in Europe for the traditional cheeses. 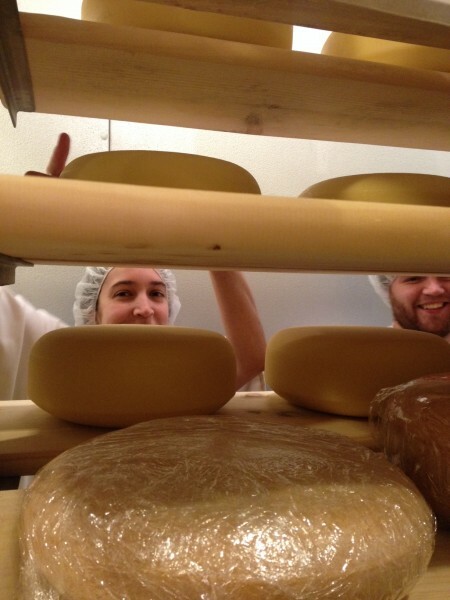 Check back here soon for a new post on how we handle aging cheese here at Lively Run. Thanks for reading! Shoot me an email if you have any questions and remember you can always come check out the farm and cheese room in the summer time. Hope to see you all soon!